Hey everyone, I thought I would share this trick I used to get my carb float seat out. First I left the carb outside, which is a little below 0 degrees here in Montana, to shrink the seat and Spray Nozzle. I was able to get the Spray Nozzle out with a large flat blade screwdriver and a wrench used to turn the screwdriver. It came out nicely. Next the Float Seat: I used a Nickle as the flat driver (like a large Screwdriver blade) to catch the ears of the float seat and twisted the nickle with a pair of needle nose vise grips. Use Caution when removing the seat not to damage your float hinge. It bent the nickle a little but it worked great. 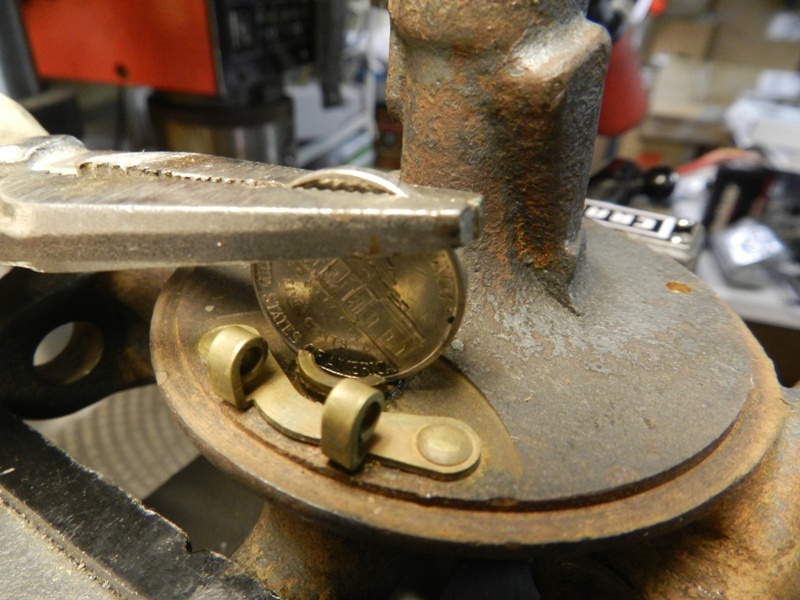 The nickle is not quite thick enough to be perfect but it works and the seat came out undamaged. (I am using a new seat for this carb but . . . ) Nice that it came out whole. "Nickel" Spelling. I spotted the mistakes as I hit post. I don't think that would work for one that is really stuck in there. I'd like to see a new tool in the catalogs made for that purpose, and a pilot that goes in to keep the tool straight. I don't thing ANY tool will get the seat out if is stuck tight enough. All not matter what tool will do to the soft brass is break it off. If it is stuck tight enough that I can't get it out with a wide tip screw driver, I heat the carb in that spot red hot, dunk it in cold water. Then you can almost take if out with you fingers. My Seat was in there really tight. Even after a little heat with a propane torch and then with the carb frozen to below zero it bent the Nickel but it did come loose. Everyone's level of stuck might very. A "little heat" doesn't work. Like Dave said, heat it cherry red and let it cool. You don't even have to dunk it in cold water, once it is cool, you can almost take it out with your fingers. I guess, I was scared to go cherry red and I am not sure the Propane torch would get it to that level. I don't own an Oxy-Acetylene setup so was trying to do it with what I had. Getting it that hot does change the metal characteristics (Not critical in a carb) but changes it non the less. I would stay away from using this method on axles for Spring Perch removal though. Allot of people may not have access to that kind of setup either, so it was a workaround that seemed to workout. Heat the cast iron carb , not the float seat, and then let it cool. It won't harm the carb. Spring perches and axles are a different story. A carb is iron and brass and the two expand at different temps and rates. This will break the bond between them. Axles and spring perches are steel to steel. Heat may help break the bond or the rust, but you must not over do it, and don't quench, let it cool naturally or slow it by covering with sand. I used to work in an old-time alignment and suspension shop where we heated and straightened suspension and steering parts all the time. They had been doing this since the 1930's without any problems. You would never find anyone doing this now. Too much liability.